At the same time that Mercury's first full day in your financial sector is a chance to get your head in the game and start working with his smart head for money ahead of lucky Jupiter's return next week, Mars' return to your relationship sector means you'll still need to make your relationships a priority. Welcome to a wrap over period that will extend out for the next 2 months, with relationship matters that are still unfolding while powerful new financial forces are unfolding, with both battling for your attention. 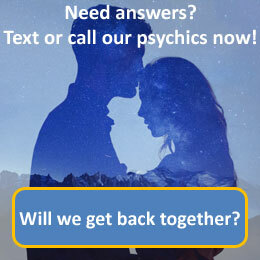 Call 09069 669 611 for a more detailed reading with our psychics today. Aquarius, the water bearer, is the eleventh astrological sign in the Zodiac, originating from the constellation Aquarius. Aquarius is considered a "masculine", positive (extrovert) sign. It is also considered an air sign and is one of four fixed signs. Aquarius has been traditionally ruled by the planet Saturn, and, since its discovery, Uranus has been considered a modern ruler of this sign. Individuals born under the sign of Aquarius tend to have a vague expression, high forehead, finely chiselled features, the face is usually long and oval with flat planes, and there is a look of nobility suggestive of the classic Greek or Roman models. They are above average height and have a slender figure. Their eyes are usually light coloured that convey remoteness and have a dreamy quality. Aquarians are friendly, trend setting, strong willed and enigmatic. They can also be outspoken, conceited and rebellious.